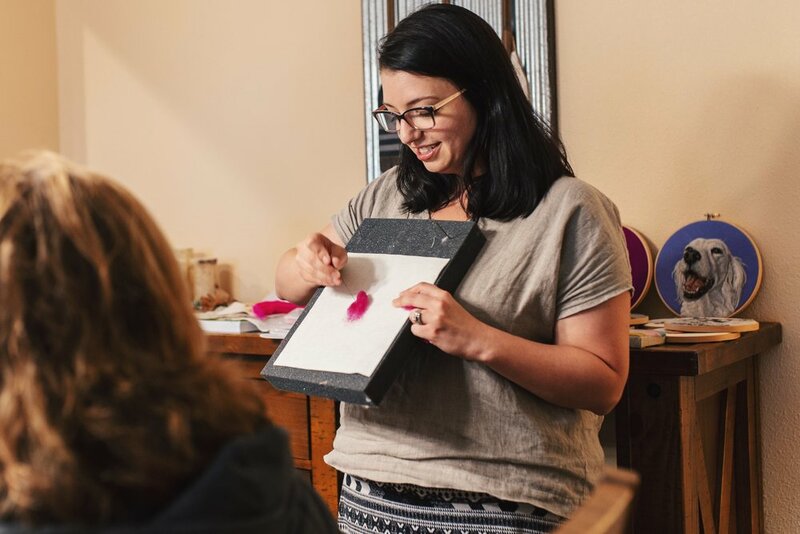 Stacie will lead you through the art of block printing and the many ways to create beautiful, repeatable designs by carving into rubber blocks and stamping onto fabric. Students will learn how to use minimal shapes, lines, and textures to create visual interest. 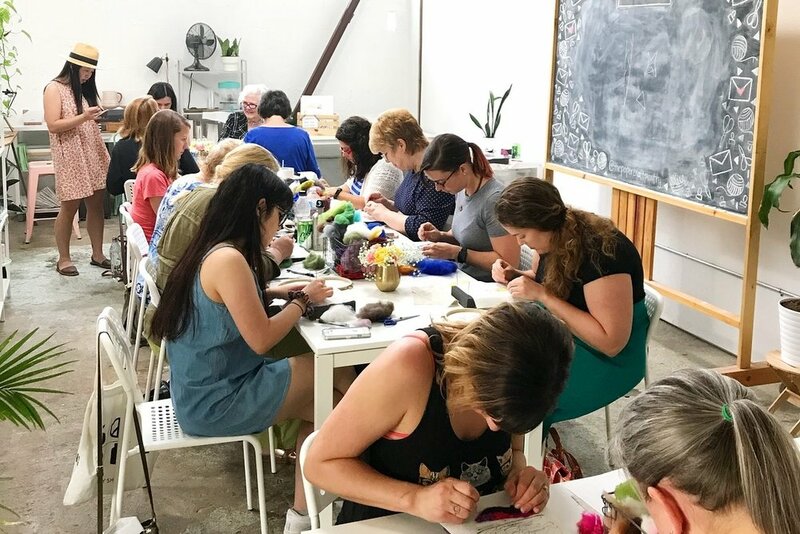 This is a great intro to blockprinting and you will leave with your own carving tools set, extra blank rubber block, as well as a tote bag featuring your very own hand-stamped pattern. Leana will be leading a session all about painting watercolor landscapes. Our inspiration will be the surrounding mountain scenery, and if the weather is nice, we’ll paint outside! 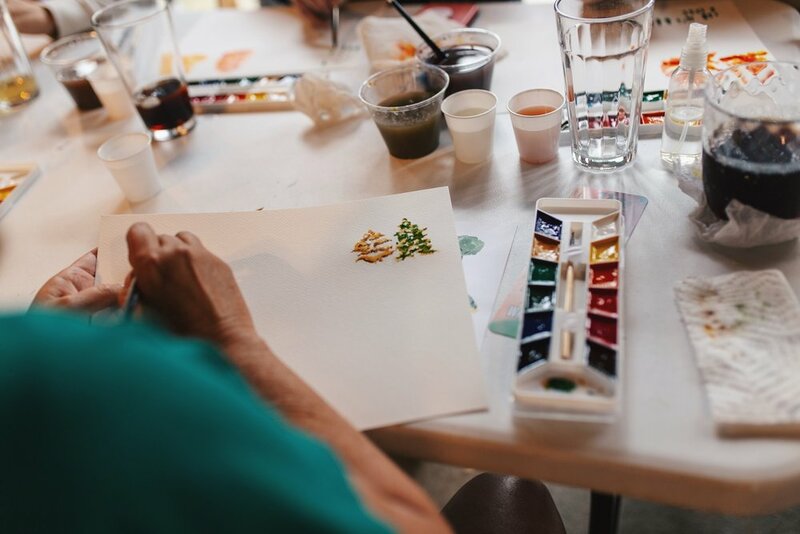 During this two-hour course, you will learn a variety of basic watercolor techniques, with a focus on landscape elements such as trees, mountains, and ponds. The goal of this workshop is that you leave feeling ready to enjoy painting your own landscape scene. Each student will bring home their own watercolor kit, brushes, and small pack of watercolor paper. Tram will be leading a workshop on the fundamentals of ink floral and landscape drawing. In this three-hour session, Tram will guide you through how to break down the art of ink drawing. You will learn how to create minimal designs as well as in-depth details with multiple shading techniques. Weather permitting, we will explore the natural beauty of our retreat and collect natural items to draw from. This workshop will give you the confidence to use ink pens to create beautiful, ink artwork! Each student will receive their own artist kit, complete with a sketchbook, pencil, archival pens, and drawing guide. 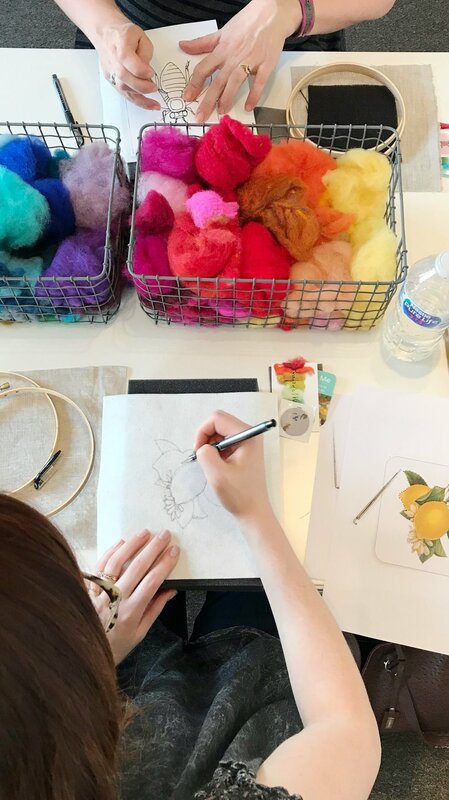 Amber will be sharing her favorite fine art secrets in a relaxing, two hour workshop. Each participant will receive a beautiful, pre-gessoed, 9x9-inch birch panel handcrafted by Amber's husband. 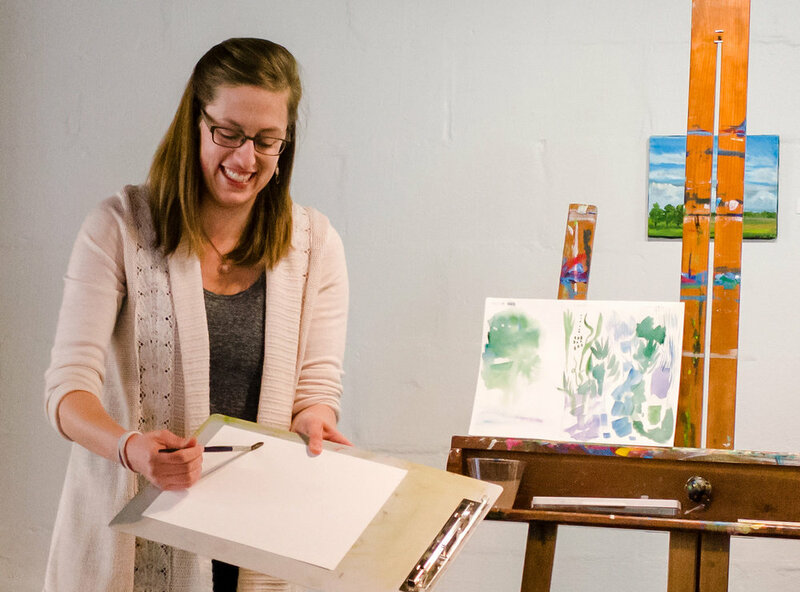 Amber will then walk everyone through a step-by-step process on how to create your very own original, abstract work of art by utilizing collage, acrylic paint, wheat paste, paint pens, and graphite. Students will have the freedom to create openly and freely based on Amber's techniques to create something that you are truly proud of. Upon completion, participants will learn the best way to prep their new works of art with hanging wire for a gallery display! 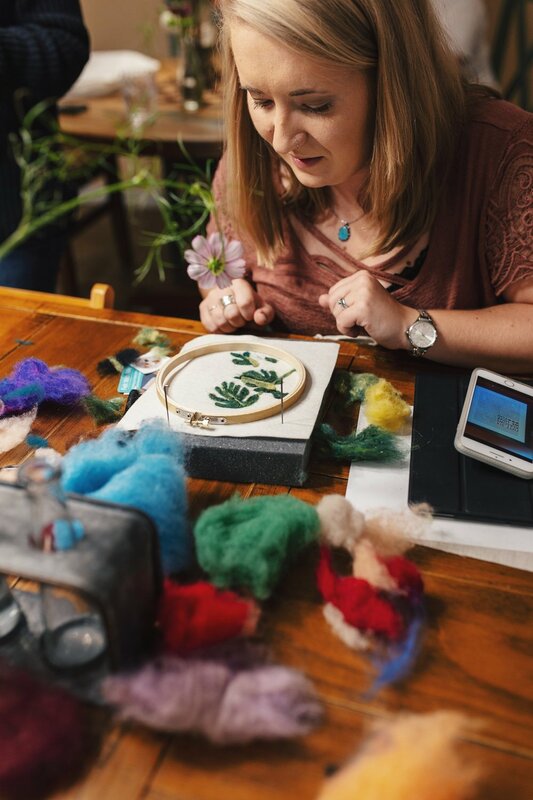 Dani will guide you through the art of Painting With Wool and teach you lots of two-dimensional needle felting techniques that you’ll apply to your own tastes and style. Kits will be provided (that you’ll use and take home after class) and will include everything you need to finish multiple projects. 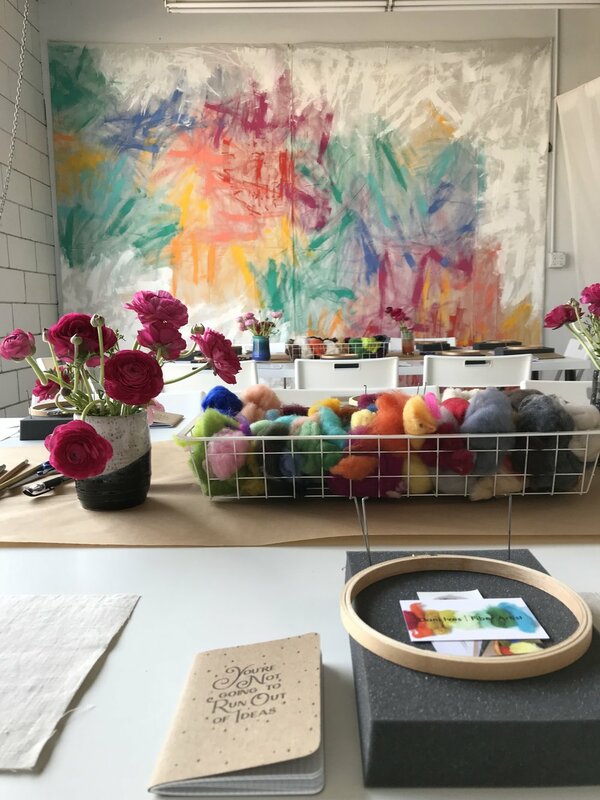 After an introduction to basics, we’ll dive into more specific methods to build up your felting skills. Topics I’ll discuss and demonstrate include getting an image onto your fabric, different techniques for blending colors, and how to achieve fine details and various textures. You can work at your own pace, and I’ll be able to provide everyone with one-on-one assistance as desired. I encourage you to come with an idea or two of something you’d like to create, plus fun patterns will also be available. Each of us is an artist who also runs her own business. We know that running an art business and making a sustainable living as a creative can look different for everyone. We’d love to share our experiences with you and offer advice where we can. In this two-hour session, we’ll address your questions (you’ll have the chance to submit beforehand) and give mentorship and guidance. *Please acknowledge that no legal advice can be given.